1. any of the soft-bodied, elongated, naked invertebrates of the phyla annelida, acanthocephala, aschelminthes, and platyhelminthes; called also vermis. Worms are often found as parasites in humans and other animals; in North America the most common of these are roundworms and tapeworms. flukes are a serious problem in other parts of the world. Most worm infections are transmitted from person to person via feces that contaminate food and water. Serious worm infections may cause anemia, listlessness, fatigue, irritability, abdominal pain, diarrhea, and weight loss. Parasitic worms usually live in relative balance with their human hosts, taking enough nutrients to survive without destroying the health of the host. However, they reduce the strength and energy of the bodies they inhabit, often produce very uncomfortable symptoms and should never go untreated. Suspected cases of worms should be brought to the attention of a health care provider; self-treatment is likely to be ineffective and can be harmful. Effective medications against worms are available by prescription. Ole, Danish anatomist, 1588-1654. See: wormian bones. 1. anatomy any structure resembling a worm, for example, the midline part of the cerebellum in the forms of "vermis" and "lumbrical." 2. Term once used to designate any member of the invertebrate group or former subkingdom Vermes, a collective term no longer used taxonomically; now commonly used to designate any member of the separate phyla Annelida (the segmented or true worms), Nematoda (roundworms), and Platyhelminthes (flatworms). Important species include Dracunculus medinensis (dragon, guinea, Medina, or serpent worm), Enterobius vermicularis (seat worm or pinworm), Loa loa (African eye worm), Moniliformis (phylum Acanthocephala, thorny-headed worms), Oxyspirura mansoni (Manson eye worm), Pentastomida (tongue worm), Strongylus (palisade worm), Thelazia (eye worm), and Trichinella spiralis (pork or trichina worm). For some types of worms not listed as subentries here (because they are usually written as one word), see the full name. 1. any of the soft-bodied, naked, elongated invertebrates of the phyla Annelida, Acanthocephala, Aschelminthes, and Platyhelminthes. flat worm any of the Platyhelminthes. spinyheaded worm , thorny-headed worm an individual of the phylum Acanthocephala. 1. Any of various invertebrates, especially an annelid, flatworm, nematode, or nemertean, having a long, flexible, rounded or flattened body, often without obvious appendages. 2. Any of various crawling insect larvae, such as a grub or a caterpillar, having a soft elongated body. 3. Any of various other animals, such as a shipworm or a slowworm, having a long slender limbless body. 4. worms Medicine Infestation of the intestines or other parts of the body with parasitic worms; helminthiasis. To cure of intestinal worms: wormed the dog. any of the soft-bodied, elongated invertebrates of the phyla Annelida, Nemathelminthes, or Platyhelminthes. Some kinds of worms parasitic for humans are hookworm, pinworm, and tapeworm. See also fluke, roundworm. Parasitology A soft-bodied, elongate invertebrate of certain phyla: Annelida–class Hirudinea, Aschelminthes–class Nematodes, Platyhelminthes– eg, class Trematoda. 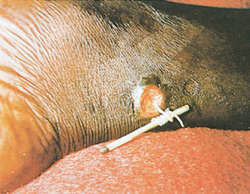 See Hookworm, Ringworm, Screwworm. 1. anatomy Any structure resembling a worm, e.g., the midline part of the cerebellum. 2. Term once used to designate any member of the invertebrate group or former subkingdom Vermes, a collective term no longer used taxonomically; now commonly used to designate any member of the separate phyla Annelida (the segmented or true worms), Nematoda (roundworms), and Platyhelminthes (flatworms). Important species include Dracunculus medinensis (dragon, guinea, Medina, or serpent worm), Enterobius vermicularis (seat worm or pinworm), Loa loa (African eye worm), Moniliformis (phylum Acanthocephala, thorny-headed worms), Oxyspirura mansoni (Manson eye worm), Pentastomida (tongue worm), Strongylus (palisade worm), Thelazia (eye worm), and Trichinella spiralis (pork or trichina worm). 2. Any small, limbless, creeping animal. 3. The median portion of the cerebellum. The common name of worms of the genus Oesophagostomum. Q. how will i know if i have a tape worm in my body? A. Most people who are infected with tapeworm don't show symptoms. If you suspect you have a tapeworm you'll need your doctor to check your stool or send samples to a laboratory for testing. A laboratory may use microscopic identification techniques to check for eggs or tapeworm segments in your feces. Q. Is it possible to have pin worm on directly on the skin of your fore arms? I've had this condition for more than a year. The only thing that makes a difference is something to kill parasites. Nothing works efficiently. I itch all over beside having big sores on my arms and back. I've hade blood test that show that there are no parasites in the blood. So now what do I do? I am constantly digging this out of my skin, and the buggars jump. A. I'm seeing a dermatologist. They said it wasn't scabies. That's what I thought it was at first. I keep breaking out in new places. The Dr. say's it's dermititous, but I'm seeing something different. Went I first broke out with this I felt crawly in the area I now have the sores.